Onyx is a black or red gemstone found in various regions of the world including Argentina, Australia, Brazil, Canada and the USA. Onyx takes its name from the Greek word "onux", which means fingernail; this could be due to a Greek legend, in which Eros mischievously cut the fingernails of Aphrodite with an arrowhead whilst she slept, and the gods turned the clippings into stone. Black onyx is thought to have protective properties and to bring inner strength, self-confidence and mental discipline to its wearer. 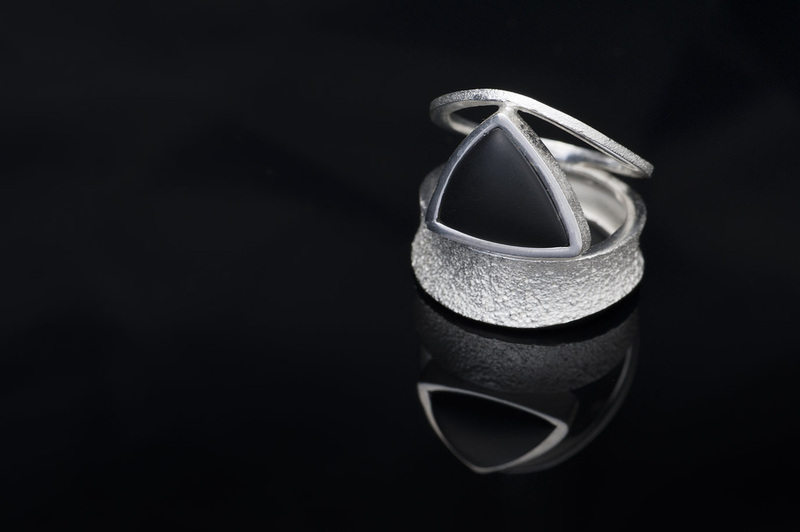 Additionally, onyx is said to help to release negative emotions and alleviate fear and anxiety. ​Physically, onyx is believed to help in wound healing, childbirth, eye and ear problems and to benefit the skin, hair, teeth and nails. Onyx is the birthstone for the zodiacal sign of Leo and the seventh wedding anniversary gemstone. This handmade sterling silver ring with onyx is a real statement piece, for it brings something new to look at, every time you wear it. Available with rose quartz, smoky quartz, onyx, and white spinel. In geometry an isosceles triangle is one that has two sides of equal longitude. In the Isosceles collection the artist put a lot of effort in achieving the maximum possible esthetic with the minimum of elements. A work of an architecture combining two simple textured arches of differing thicknesses that sustain a triangular gemstone. The artist attempted an esthetic purification or a synthesis of beauty which resulted in a modern piece that has a potent visual impact.